What Are “Natural Causes” in 20‑year‑olds? Two flags stand outside the front door of Stan and Shirley White in the mountains near Davis, West Virginia, each emblazoned with a single gold star. The stars commemorate the two sons they lost to the wars in Afghanistan and Iraq. 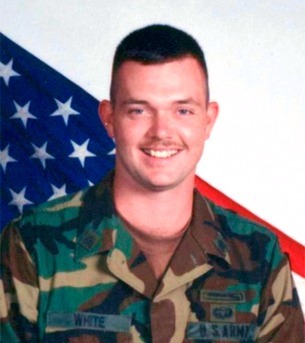 Robert, the Whites’ eldest, was a Ranger who died in a 2005 rocket attack in Afghanistan. He was 34. 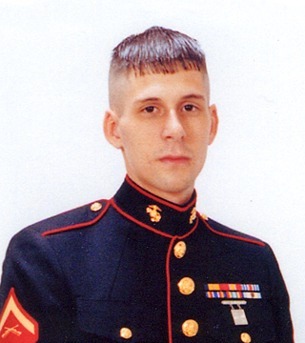 Andrew, 12 years younger than Robert, served as a Marine combat engineer in Iraq but after returning to the States died of “fatal drug intoxication,” according to the medical examiner’s report. He was 23. To the Whites, both were casualties of war, Robert from the violence recognized as part of battle, Andrew from something entirely new: the flood of mind-altering psychiatric drugs—antidepressants, antipsychotics, stimulants and more—administered by military physicians. For service personnel and veterans, these substances cause an array of problems, from violence and suicide to heart attacks. Andrew White is one of the “Charleston Four,” West Virginia veterans—all in their 20s—who died in their sleep, apparently from sudden cardiac arrest induced by the many psychotropic drugs they were prescribed. All four (also including Eric Layne, Nicholas Endicott and Derek Johnson) had been diagnosed with “Post-Traumatic Stress Disorder”—PTSD. All had been prescribed a combination of the antidepressant Paxil, the antipsychotic Seroquel and the benzodiazepine tranquilizer Klonopin by Department of Veterans Affairs or Department of Defense doctors. And each showed no signs of illness before going to sleep. In interviews with Freedom, Stan White described those drugs as a “lethal cocktail,” as he recounted his son’s downward spiral on them. He described Andrew as a high school honor student and Eagle Scout who wanted to be a career Marine. Those missions included hunting for improvised explosive devices in hotly contested Anbar province and conducting house-to-house searches for explosives and weaponry. During one search, Andrew’s company discovered a torture chamber where the implements of horror included IV bags filled with motor oil, ready to be dripped into captives’ veins. Then, in August, massive explosions shredded a convoy for which Andrew’s unit had been providing protection, killing 14 Marines and an interpreter. Nine of the Marines were from the Ohio National Guard’s Lima Company, which ultimately emerged with 23 killed and at least 40 wounded in Iraq. Andrew had been home from the war less than five days when the Whites were informed of Robert’s death. “Andrew went through all the grief and trauma from losing Bob,” Stan said. When Andrew sought help from the Department of Veterans Affairs, it came in the form of drugs, including Seroquel. “He began having nightmares and started sleeping with the light on,” Stan said. In response to his problems, dosages of Seroquel and other drugs were increased. Described by his family as a compassionate, caring person before the drugs, Andrew changed, bursting into fury over the smallest matter while also plagued by severe digestive problems, disorientation, tremors, and other physical difficulties. Then, just short of one year after he started taking military-prescribed drugs, he was found dead in his bed. Similar tragedies have shaken many families. In an abrupt change from previous conflicts, today’s war zones are awash in psychiatric drugs, as are the facilities established to assist veterans stateside. One Department of Veterans Affairs professional with more than 20 years of service in the VA told Freedom that while veterans now often find it hard to get enough physical therapy or other time-proven treatments to assist them, mind-altering drugs are readily available and heavily pushed. The system, he said, has discarded actual care and replaced it with drugs as the “solution”—a pattern that observably does not work but has been accelerating since the first Gulf War in 1991. He described one young veteran assigned to a part-time cleaning job at a major VA hospital who would simply lean on his broom, stare into space and drool, his mind shattered by the powerful psychotropics administered by VA doctors. Indeed, issues surrounding the VA have mounted into a crisis over the past few years, much of it involving reports of serial misconduct and questionable scheduling practices system-wide that resulted in critically ill veterans failing to receive care at all. It culminated in May 2014 with VA Secretary Eric Shinseki resigning in disgrace. His departure came under pressure and at the behest of President Barack Obama as stories emerged from all over the country of veterans denied even basic services in a broken system. Within one large local VA system, according to data provided by the whistleblower, who asked not to be identified for fear of losing his job, 33 medical doctors are devoted to Physical Medicine and Rehabilitation (PM&R) while within the same system, some 800 psychiatrists and 260 psychologists are employed—roughly 32 times the number of PM&R doctors. In March 2014, a joint Army-National Institutes of Health study summarized what has become common knowledge through media reports in recent years: that suicides among military personnel and veterans looms as a major problem. More military personnel killed themselves in 2012, according to the Defense Department, than died in combat that year. Suicide totals among active-duty personnel, 349, exceeded the Afghanistan death toll of 295. Military demographics show that nearly half—49.3 percent—of active duty enlisted personnel are 25 or younger. But other severe issues enter the picture. Fred A. Baughman Jr., a California neurologist with more than 40 years of professional experience and an outspoken critic of the psychiatric establishment, notes that these drugs literally cause hearts to stop beating. Many reported “suicides,” he believes, may be cases of drug-induced sudden cardiac arrest, and cites the case of Iraq veteran Ryan Alderman. Alderman was found dead in his bed in Fort Carson, Colorado. His father, Tim, described how Ryan carried out hundreds of missions in Iraq and received three awards of excellence from his commanders. Returning to the States, Ryan sought treatment for back pain, for which drugs were prescribed. Yet his death was labeled a suicide, a label his father and others strongly dispute, giving support to the opinion that many military and veteran “suicides” reported by the media may be cases where psychopharmaceuticals triggered cardiac arrhythmia and cardiac arrest. Psychiatrist and author Colin Ross examined Ryan’s medical file and the Army’s investigative reports of his death just five days after release from Cedar Springs. Neurologist Baughman, who also examined the records, said they fit the pattern of drug-induced cardiac arrhythmia tragedies he has been documenting, as in the case of Andrew White and the Charleston Four. As of July 2014, Baughman had documented 400 cases in which he believes the use of antidepressant and antipsychotic drugs—including Seroquel—caused sudden cardiac death in normally healthy young soldiers. Military bases around the globe have experienced incidents of unexplained sudden death, but it has been the exception rather than the rule when news media probe the role of prescribed psychiatric drugs in such events. Journalist Julie Robinson of the Charleston Gazette is one of the exceptions; she investigated the cases of the Charleston Four and helped to part the curtain that shrouds such tragedies. Many experts believe it is not coincidental that deaths of young soldiers are piling up in the wake of statistics like this one: Between 2005 and 2011, the military increased its prescriptions of psychoactive drugs (antipsychotics, sedatives, stimulants and others) by almost 700 percent, according to the New York Times. Prescriptions for antipsychotics for active-duty troops increased 1,083 percent during those same years, while the number of antipsychotic drug prescriptions in the civilian population rose a scant 22 percent. 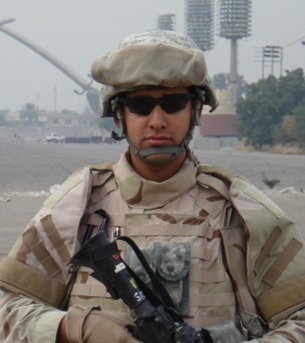 Aaron Glantz is a Peabody Award-winning journalist with the Center for Investigative Reporting who has for more than a decade covered the Iraq War and the treatment veterans receive when they come home. He recently helped expose how the VA has become the preeminent drug pusher for far too many veterans-turned-addicts, citing a VA study showing the fatal overdose rate among its patients while at the same time continuing to prescribe powerful drugs with impunity. The epidemic of so many young veterans perishing led to a July 2014 House Veterans’ Affairs Committee hearing on what can be done to reverse the tide that has led to so much suffering, chronic illness, violence and death for America’s veterans. Warren Goldstein, assistant director for Traumatic Brain Injury and PTSD Programs for the National Veterans Affairs Council of the American Legion, testified that 59 percent of veterans surveyed reported “no improvement” or that they were “feeling worse” after having undergone TBI and PTSD treatment—and that a sizable proportion of the respondents reported prescriptions of up to 10 drugs. 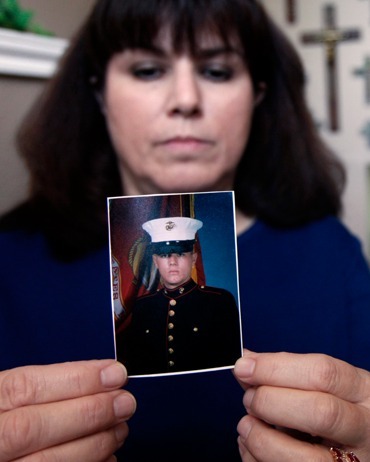 Julie and Eric Oligschlaeger know all too well the dangers inherent in the mass mix of such powerful narcotics on the brain and body, having lost their son Chad after two tours in Iraq. Despite a doctor’s order that he not be redeployed, Chad went back to Iraq because a sergeant, his father said, threatened to turn him in for underage drinking if he did not return. When Chad returned from his second tour, military doctors prescribed a regimen of drugs that included, according to his mother, Seroquel, the antidepressants Trazodone and fluoxetine (Prozac), and zolpidem (Ambien), a sedative-hypnotic. It wasn’t long before Julie lost her “jovial son,” as she described Chad. “On the drugs, it was like he was just existing,” she said. “He would slur his words, he would forget.” These are adverse drug reactions, evidence that any physician acting wholly in the interests of his patient would have taken as an alarm to lower the dose or stop administering them, said Baughman. A fellow Marine who had been in Chad’s room the night he died told Julie that Chad had 19 pill bottles. “He said that Chad was trying to get the bottles all lined up, because he was forgetting when he was supposed to be taking them,” Julie said. The confusion he exhibited was itself an adverse effect of drugs poisoning the brain, said Baughman. “We don’t have room yet” are the words Chad heard time and again as he waited to enter a detox facility, according to his father. “A week would go by,” Eric Oligschlaeger said, and the word would come back, no room yet, so Chad would wait another week. “They did that for six weeks. And then he died,” Eric said. Baughman, who with the help of Stan and Shirley White took the matter of drug-induced cardiac arrest deaths to Capitol Hill, has called for a federal investigation into these tragedies, labeling them a “poisoning” of veterans by military psychiatrists. The Whites have gone from the halls of Congress to the Oval Office in their efforts to keep veterans from dying. First Lady Michelle Obama forwarded a letter from them to the Department of Veterans Affairs saying that an investigation into Andrew’s death confirmed the initial finding of “fatal intoxication by prescribed and non-prescribed drugs.” And Senator Joe Manchin of West Virginia listened to their concerns, and got action. Yet the shocking truth is that Seroquel was—and still is—being used by the military, a fact the Whites learned from an April 10, 2012, memo from the Army Medical Command, warning about the dangers of using benzodiazepines such as Xanax and Valium and antipsychotics such as Seroquel. The memo cited “numerous concerns with potential long-term adverse health effects” of antipsychotics, including “cardiac effects.” The antipsychotic Risperdal, in the same class as Seroquel, was discussed as the subject of “a large multicenter VA cooperative study” and found to have harmful effects that outweighed any benefits. It is for this and many other reasons that Julie Oligschlaeger offers her own plea regarding the culture of drugging veterans into oblivion and the need for change now. Lieutenant Colonel Bart Billings, a retired Army psychologist, has long championed the use of alternative, non-drug therapies to heal veterans’ mental scars. He blames military psychiatrists for being in bed with pharmaceutical companies, creating a situation where a reported 90 percent of U.S. troops in combat zones have been on some form of psychiatric drug, while on battlefields 180-day supplies of deadly drugs such as Seroquel were being passed around like candy. The suicide rate in the U.S. Army begins climbing in the early 2000s, and by 2008, exceeds the demographically matched civilian rate. 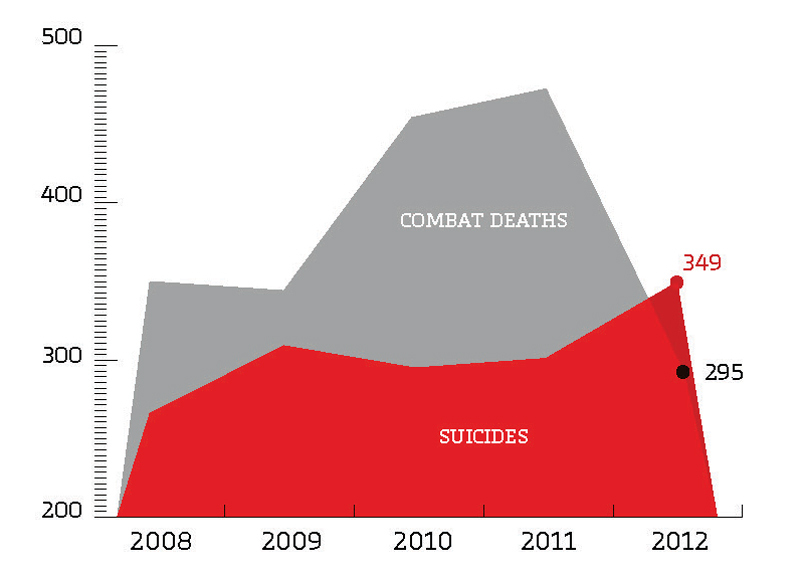 349 suicides among active-duty personnel; 295 combat deaths in Afghanistan. More than 54,000 Seroquel prescriptions written by the military in 2011, 99 percent of them off-label, for uses not approved by the FDA. Antidepressants increase the risk of suicidality in children, adolescents and young adults through age 24; 49.3 percent of active-duty enlisted personnel are 25 or younger. Psychiatrist Matthew Friedman, then executive director of the VA’s National Center for PTSD, attended the 2012 annual convention of the American Psychiatric Association, apparently to weigh in on the need to saturate veterans with drugs. Friedman, now a “senior advisor” to the center, has admitted receiving “honoraria” from Seroquel’s manufacturer, AstraZeneca, and from Shire, Ortho-McNeil and GlaxoSmithKline. To be sure, many parents of victims, including the Whites and the Oligschlaegers, remain resolute in their mission to stop military and VA psychiatrists from drugging those under their charge to prevent more names from appearing on the long list of victims of sudden cardiac death. There is also the sad and infuriating story of Anthony Mena, who like Andrew White died at age 23. His parents, Pat and Willie Mena of El Paso, Texas, spoke with Freedom about the toxic effects of antidepressants, antipsychotics and other drugs Anthony was prescribed after two combat tours. Anthony, Pat said, had complained of pain in his back, but was told by an Air Force psychiatrist and other military doctors that his problems were all in his head, due to stress from being in combat in Mosul and Baghdad. They implemented a drug regimen that failed to help. Even with painkillers, he suffered severe pain; even with antidepressants, he was unhappy; even with sleeping pills, he could not sleep. It was only after many drugs and consulting with a civilian doctor that hard evidence showed his physical problems were all too real. His back and neck had sustained pinched nerves, herniated disks and two broken bones. Once Anthony embarked on the regimen of psychiatric drugs—many of which are addictive—his list of medications grew until he literally had prescriptions for dozens of them. Then, on a July night, with no less than nine psychiatric drugs—all of them prescribed—in his system, Anthony died in his sleep. There is no doubt in the minds of the Menas that drugs killed their son. “It is disgusting the number of drugs that are being pumped into our suffering heroes,” Pat said. To prevent future tragedies, they helped to launch the Tony Mena Memorial Race, an annual event in El Paso that raises awareness of the need for proper care for veterans. More than halfway across the country, meanwhile, the legacy of Andrew White lives on with his parents, Stan and Shirley, who now campaign to expose the dangers inherent in the psychiatric drugging of veterans. And together, the Whites, the Menas, the Oligschlaegers and others continue to fight for accountability in the drug-related deaths of military personnel and veterans. James C. Lynch was a journalist whose passion was uncovering news that many people worked to conceal from public view, helping him to become the lead investigative editor for Freedom. In 2013, he zealously pursued a revelatory story detailing how the U.S. military, with an assist from the pharmaceutical industry, was drugging servicemen and women literally to death. Sadly, before completing his investigation, Jim passed away. The article ultimately was finished by his Freedom colleagues. While it is by definition a collaboration, the piece you are now reading stands as a stirring tribute to Jim’s talent and tenacity. 1 Andrew White was administered the antidepressant Paxil, the antipsychotic Seroquel and the benzodiazepine (tranquilizer) Klonopin, among others. 2 Antony Mena was administered no less than nine psychiatric drugs—all of them prescribed. 3 Chad Oligschlaeger was prescribed a regimen of drugs that included Seroquel, the antidepressants Trazadone and fluoxetine (Prozac), and Zolpidem (Ambien), a sedative-hypnotic.